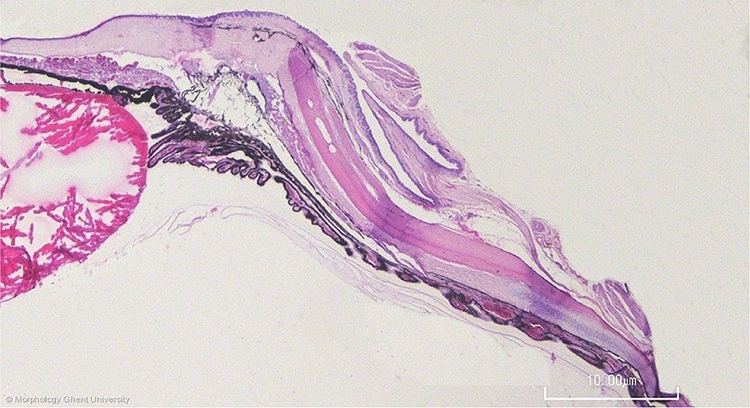 At the micrograph above, part of the cornea and sclera is visible. In the sclera, a ring of bony ossicles is present which form the scleral plate. The scleral cartilage ends internally on these ossicles. Processes (processus ciliares) of the ciliary body (corpus ciliare) attach directly to the lens capsule. Only the posterior part of the ciliary body is attached to the lens by zonular fibers. At the micrograph above, the zonular fibers and the lens (lens fibers) (fibrae lentis) are disrupted. Only small part of the iris is visible.